Whether you're new to skiing or have been skiing for years, you can't overlook the importance of ski gear. One of the most critical pieces of equipment is your ski boots! Skiers often look for the puffiest ski jacket and waterproof pants. They'll spend days searching for the perfect skis but won't think twice about the boots that sit atop them. Skiers have to take the time to find the right ski boots. For some, it is something with a soft flex to help them gather their bearings and balance as a beginner. Others, with more experience, will prefer a firm flex so they can perfectly land that 720. You have to try on several boots to find the perfect fit. Comfort is something skiers often overlook also. Many think it's about buying the best brands and spending thousands of dollars on ski gear. Although these factors matter, skiers have to feel comfortable on the slopes. So, let's see which boots are the best boots, for all experience levels and budgets. As a skier, you'll have hundreds of ski boots to select. Narrowing down your options will help make the purchase decision easier. No matter what your experience level, there are several options available. 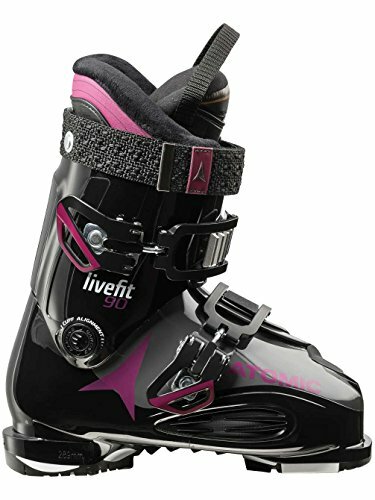 If you're a beginner, the best boots are the Atomic Live 80. One of the best features is the fact that the boot transitions into a medium flex. 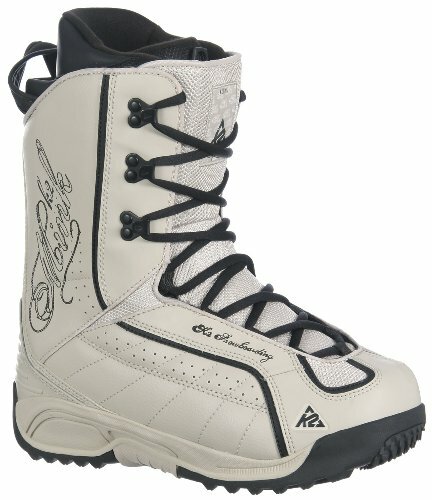 So, beginners can learn to ski with these boots. And, with a flex rating of 80, it provides more support than a softer flex. It also features large buckles. Plus, there is the walk/ski setting so skiers can walk indoors. A durable shell and liner keep skiers warm while protecting them from the elements. 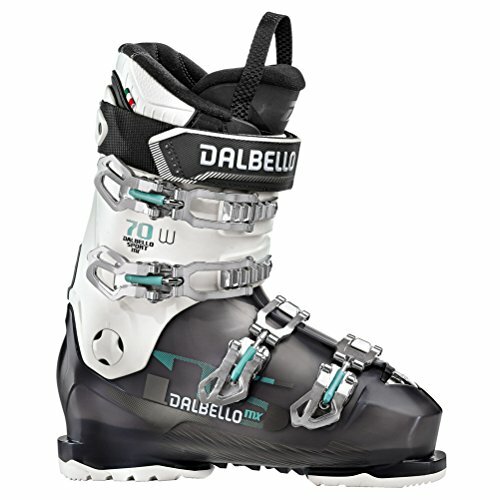 For intermediate skiers, the best choice is the Dalbello 100 ski boots. The 100 flex rating is responsive and keeps skiers in control going downhill. The performance liner is moldable. It conforms to fit the foot, depending on heat levels inside the boot. This design helps maximize comfort and keep skiers warm. A responsive tongue also eliminates shell distortion. So, they will retain their shape regardless of the skier's style. 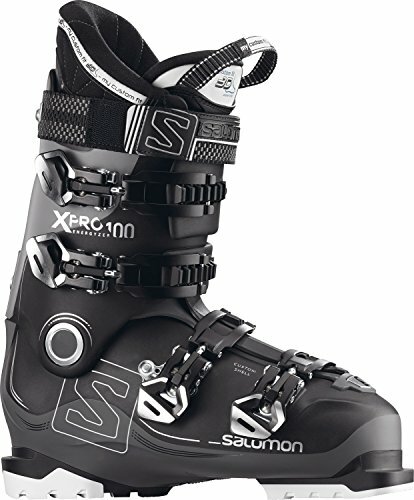 For skiers with more experience, the best ski boots are the Salomon QST boots. Skiers will appreciate the exceptionally light design and Endofit tongue. It conforms to the skier's feet, and custom shell technology ensures the best fit possible. The boots feature a secure/stability mode as well. And, the ski/walk mode is a great feature for those who are indoors frequently. They also highlight the well-known Salomon name so that consumers can rely on the quality. There are hundreds of ski boots to select. No matter what your skill level, or the type of skiing you do, there's a perfect option available. What ski boots do you own? Let us know your experience in the comments! Every skier has a different level of experience and different preferences when comparing ski gear. Because of this, the ski boots they buy will be different from the next person's. Before choosing a pair of ski boots, skiers should compare several pairs and brands. These are some critical factors for skiers to consider to find the best fit. Mondo sizing is the universal sizing all manufacturers use in their ski boots. 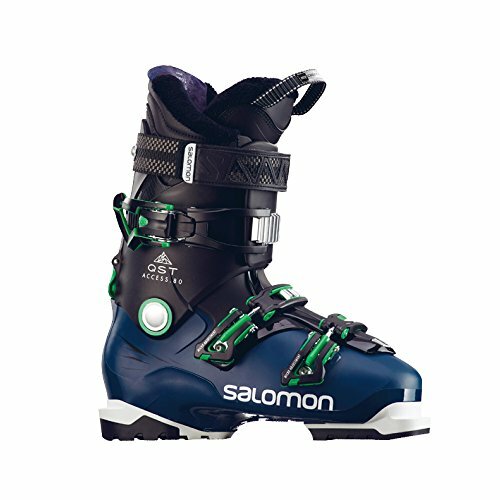 So, skiers can compare 20 brands, and their boot size should be the same. But, some attributes make one pair of ski boots more comfortable than the next. For example, one skier might prefer three buckles, while the next one likes a Velcro-fastener and two fasteners. Some skiers love to buy a different footbed or padding to increase internal comfort levels. Various features of each ski boot will improve or decrease comfort levels. Skiers have to try several boots to find the appropriate fit and a boot that fits them comfortably. The more options they compare, the easier it'll be to pick the best boots. Now that the size and fit are out of the way, the flex is another essential factor many skiers overlook. Flex refers to how rigid or stiff the base of the boot is. A soft flex is for beginners. It is more forgiving than firmer flex boots while skiing. A soft flex, however, is a little harder to control. As skiers advance, they should also increase the flex rating. Medium flex is for intermediate to experienced skiers. Higher levels of responsiveness, faster speeds, and ability to make tighter turns are some features of this level. Firm flex boots are for skiers with plenty of experience on the slopes. They feature the highest levels of responsiveness and allow skiers to move at the fastest speeds downhill. The boots are ideal for steep, aggressive skiing down mountains. They also feature high levels of absorption, helping minimize the impact upon landing. The ski boot's last refers to the width at the widest point of the boot. In recent years, manufacturers have been introducing wide last boots. They feature sizes from 102mm to 106mm. Each manufacturer has a different rating. So, it's a good idea for skiers to try several pairs to find the best last for their feet. All-mountain skiing isn't the kind of skiing same as competition skiing or speed skiing. 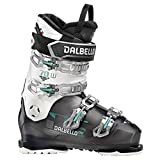 Therefore, skiers have to consider the they're doing, and their experience, to find the best ski boots. Clearly defining beginner, intermediate, and expert levels can make it easier to find the best fitting boots. Skiers should also identify if they're doing freestyle, trail, all-mountain, or all-terrain skiing. This distinction will help them find the best ski boots available for their desired uses. We compared the best ski boots available for beginner, intermediate, and skiers with the highest levels of experience. In our review, we detail several characteristics of ski boots. We compared average ratings and reviews written by actual owners of the ski boots. We also examined the prices to help skiers find the best product, for a price they could afford. In reviewing these products, we considered the top name brands and the overall quality of the best boots. The prices of ski boots vary considerably given the brand, flex level, and type of ski boots. They're available on sites like Amazon and REI as well. Other online and local retailers also carry ski boots. 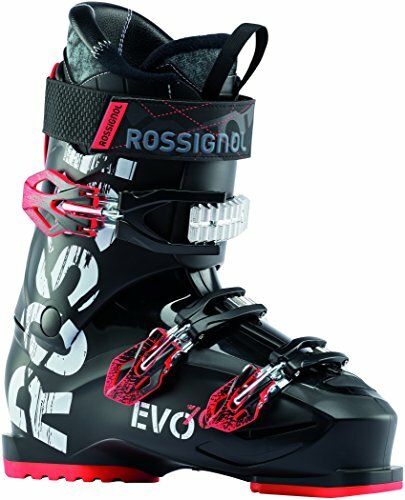 Prices fall between $$$-$$$, or higher, for high-end ski boots. Several manufacturers have multiple pairs of ski boots available for skiers of every skill level. These are the best options available, for all skiers to consider when choosing new ski equipment and apparel. The first category of ski boots is soft flex or beginner ski boots. These are some of the best options. The ski boots are perfect for people with medium to wide feet. They feature a broad base. They have a significant 24mm pivot to make adjusting tension levels easy for wearers. The wool insulation will keep your feet warm in the coldest temperatures. A soft flex rating of 70, makes these boots perfect for beginners. They also have ride/hike technology, allowing skiers to wear them indoors and on the slopes. The ski boots are for downhill skiing and feature three buckle straps for ease of adjustability and access. Although there aren't any negative ratings, the boots are expensive. Especially for a beginner boot that most skiers will outgrow and replace as they advance. The price of these ski boots is $$$-$$$. The average rating is 5 out of 5 stars on Amazon. 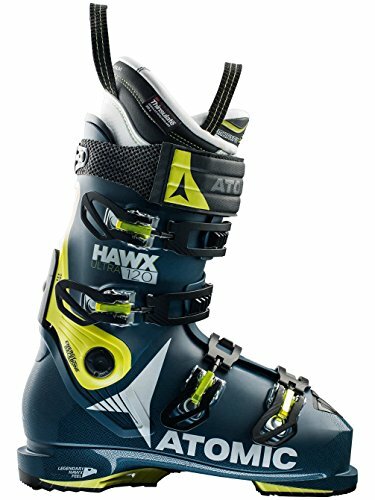 This ski boot features an 80 flex range, hovering between a soft to medium flex. It is perfect for beginners looking for solid grounding, and who don't want to replace their boots frequently. The 102mm last is ideal for skiers with broader feet, as it affords them free range and mobility. The boots feature a PE cuff and PE shell, meaning they're durable and can withstand heavy use by skiers. Large 35mm straps are also easy to adjust, to ensure the highest levels of comfort for skiers. The boots feature a solid base making them easy to balance on also. One drawback of these ski boots is that they don't have the walk/ski function. So, skiers can't wear them indoors during the ski day. The price of the boot is $$$-$$$. The average ratings are 4.8 out of 5 stars on Amazon. The boots feature a three-buckle system, allowing skiers to adjust throughout the entire foot easily. They also feature a comfort liner to help increase padding on the boot's interior. A polyurethane cuff is comfortable, and won't wear out over time either. The 104mm last is an excellent upgrade for skiers with broader feet. The size allows them to freely move their toes and feet, affording the highest levels of mobility. Skiers won't feel like their movement is restricted, which is a common complaint with narrower boots. A couple of reviewers note that the boots are soft flex, so they're for beginners. Therefore, skiers will eventually have to upgrade as they advance in experience. Another review also notes the insole slides a little when putting the boot on. This issue is a mild annoyance, rather than a major complaint about them. The ski boots are $$$-$$$. The average ratings for the product are 4.9 out of 5 stars on Amazon. For intermediate skiers, medium flex boots are the ideal option. These are some of the best varieties in this category. The ski boots feature a moldable inner liner. The IF Performance liners conform to the skier's feet. It naturally molds around the shape of their foot, given the internal heat levels in the boots. This feature maximizes comfort levels for all skiers. The boots also feature a Kinetic Response tongue. This design helps preserve the ski boot's shape. The heel remains in place, and the exterior shell protects the boot's shape over time. One possible drawback of this product is the price range. It is a little higher in price than similar medium flex boots. Therefore, some skiers can't afford the product. The price of the ski boots is $$$-$$$. The average ratings are 4.5 out of 5 stars on Amazon. This boot is the softest flex available in the K2 lineup of ski boots. It features a synchro interlocking system, allowing skiers to walk and ski in them. The ski/walk function is something a skier can appreciate if they're indoor often when they go skiing. The ski boots feature a dual alignment cuff system. They also feature a CushFit intuition liner. This liner helps preserve the most comfortable temperatures inside the boot, no matter what the exterior temperature may be. Complaints about the quality, materials, and leaking inside the boots are some negatives reviewers indicate. Skiers should keep this in mind if they're considering these ski boots. The price of these ski boots is $$$-$$$. The average rating is 3.4 out of 5 stars on Amazon. These boots feature a 99mm last and rib-tongue design. This feature helps keep them on comfortably and prevents movement while skiers are mobilizing. Lateral adjustments make it easy for skiers to loosen/tighten the boots as necessary. A forward-leaning design helps skiers avoid over-compensating when skiing. Their bodies will naturally incline forward while they're skiing. So, the boot's design helps with this motion naturally. The price of these ski boots is a major drawback for many skiers. Especially because there is plenty of competition in the industry from which to select. The price of the boot is $$$-$$$. The average ratings are 4.3 out of 5 stars on Amazon. 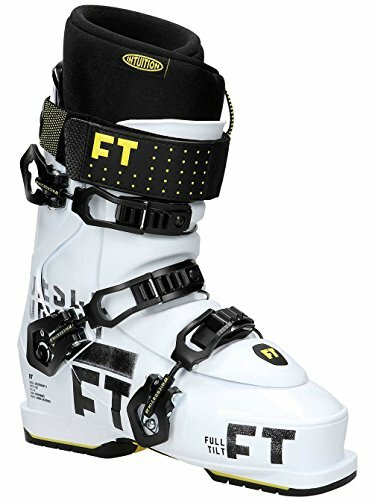 The last ski boots variety is the firm flex, for skiers with the highest levels of experience. These are the best options available. These ski boots are narrow, with a 98mm last. They feature a 3M Thinsulate insulation, to help keep the feet warm while skiing. The shell walls are thicker in areas where impact occurs to preserve the integrity of the boots. The shift, forward-lean design is easily adjustable between 13, 15, and 17 degrees. The ski boots are also flexible so that skiers can adjust the flex rating by 10 points (plus/minus). Reviewers indicate the boots are beautiful, but not worth the price consumers pay for them. For skiers looking for a firm flex, there are more affordable options available. The price of these boots is $$$-$$$. The average ratings are 3.8 out of 5 stars on Amazon. The ski boot features a 120 flex rating. It has a rib-tongue design, which sits comfortably on the skier's leg. The design prevents the boot from distorting or losing its form after several uses. The custom exterior shell is durable, and a large 24mm pivot allows skiers to adjust tension levels easily. There is a Surelock ski/walk function on this boot also. A 106mm last is perfect for skiers with broader feet, too. One skier notes it takes some time to adjust/learning curve when transitioning to the boots. That's especially true coming up from a medium flex or other brands. Apart from this, there aren't many negative reviews that customers leave about the boots. The boots cost $$$-$$$. The average ratings are 5 out of 5 stars on Amazon.